He said that the company which is largest in the coastal state with almost 44 percent of the market share has 50 percent of its customers using the internet on their mobiles. "The internet usage on Vodafone network is increasing 38 percent annually which is a substantial growth in the segment," he said. 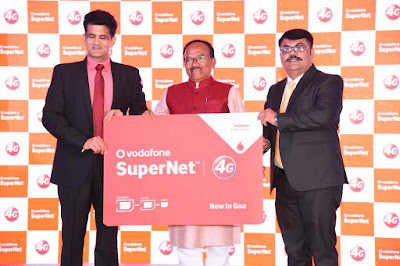 Vodafone's 4G launch of Goa follows the successful rollout of services in Kerala, Karnataka, Kolkata, Delhi and NCR, Mumbai, Haryana, UP East, Gujarat, West Bengal, Rajasthan, Maharashtra, Odisha, Tamil Nadu, UP West, Andaman and Nicobar and Punjab. Chandra said with the launch planned shortly in Chennai. Vodafone 4G coverage will be available in 2400 towns across the country by March 2017.